'Boring' Singapore City Photo: Singapore Mail boxes. For most of Singapore residents, they live in highrise homes called HDB flats. HDB means Housing Development Board. 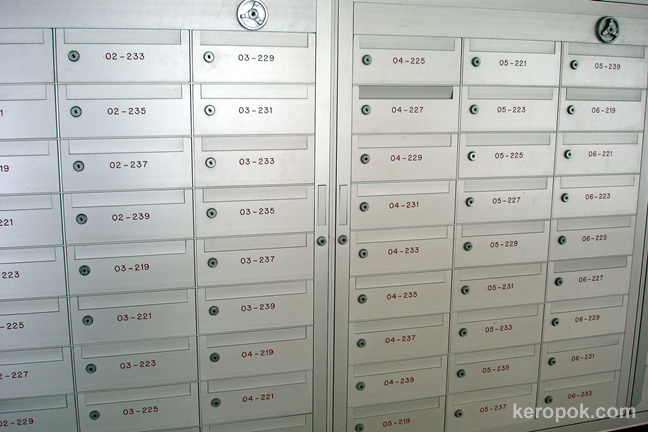 For HDB flats, mails arrives in mailboxes that looks like this one. This reminds me of the postcards that I received from a few Daily Photo bloggers around the world. Have received postcards sent from: Edwin - Kuala Lumpur DP, Jing - Shanghai DP, Jazzy - Tuzla DP, Gerald - Hyde DP, Zannnie/Zsolt - Budapest DP. You want to see some unique Singapore mailboxes for sending mails? Watch out for Theme Day on 1 April. This is a cool picture. Thank you for visiting Tuzla DP. It is my last posting today, so come and visit. I remembered these, lots of "junk mail".